Note that in the previous section I didn’t pop the back off the Nexus S and show you what’s underneath. That’s because what lies beneath is relevant to something new which the Nexus S has that no other Android smartphone has quite yet - Near Field Communication (NFC). NFC in practice is similar to RFID in that it’s a contactless, short range communications protocol - the two also work using magnetic induction and a loop antenna in the 13.56 MHz ISM band. If we finally remove the back of the Nexus S, you’ll see that loop antenna almost immediately. 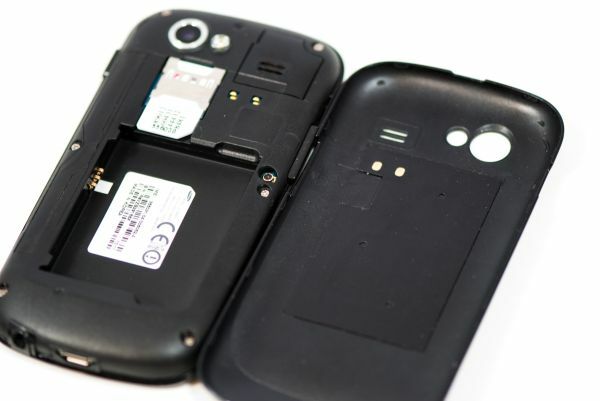 There are two gold pins on the back of the Nexus S, and a corresponding set of pins on a flex circuit attached to the battery cover inside. If you look closely at an angle, there’s a very clear circular raised area which is that loop antenna, just like we’re used to seeing. 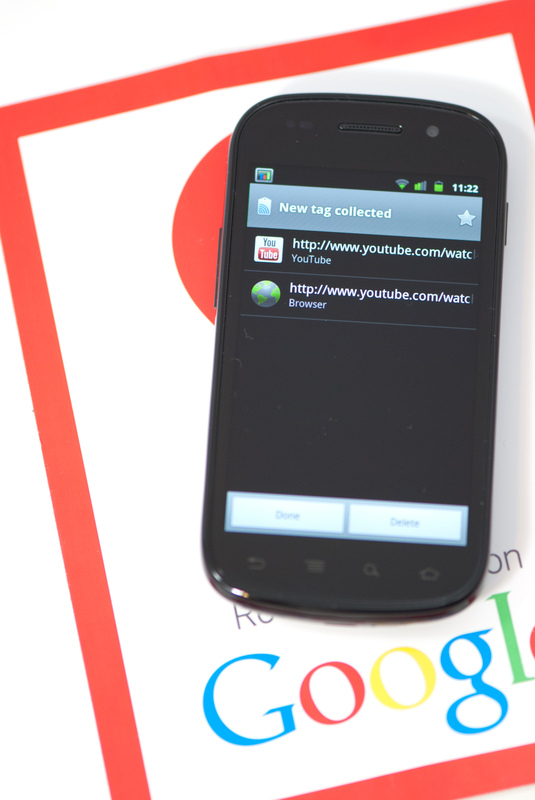 The principle is simple - bring the Nexus S near a smart tag, the smartphone induces some current, and the tag sends back some data. If the phone is on and you swipe it over a smart tag, the device will read it - you don’t need to launch an application or download something like barcode scanner. In its current state, the Nexus S can read these smart tags and act on them, offering functionality similar to a QR code. Currently scanning a tag launches the Google tag reader which shows you what information was in the tag, but other applications will be able to process tags with different intents just like you can open photos and documents with certain extensions using any Android application. NFC right now works a lot like how QR codes do, but with a few differences. I experimented a long time ago with putting a QR code on my business card, with data in a simple vcard format. If you’ve ever tried this, you’ll quickly discover that the data you can fit on a QR code is rather limited - just under 3 kilobytes. You also have to launch an application, have some ambient illumination, and have a decent camera. QR codes are awesome, don’t get me wrong, but what NFC offers is the ability to do all of that faster, with more data (storage space is a function of the smart tag’s physical size), without launching anything. The tags themselves run around 5 to 25 cents. But what about communicating with other devices and writing tags? That’s where NFC has the potential to be very interesting. 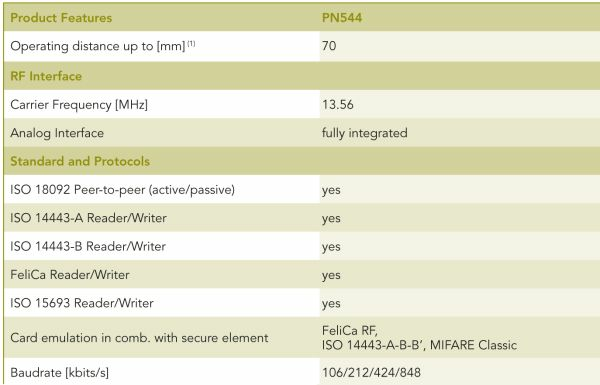 There are three different operating modes for NFC - read/write which allows the device to read a passive smart tag, P2P mode which allows for bidirectional communication between two devices at up to 848 kilobits/s, and finally smart tag emulation, where the device acts like a passive contactless tag. 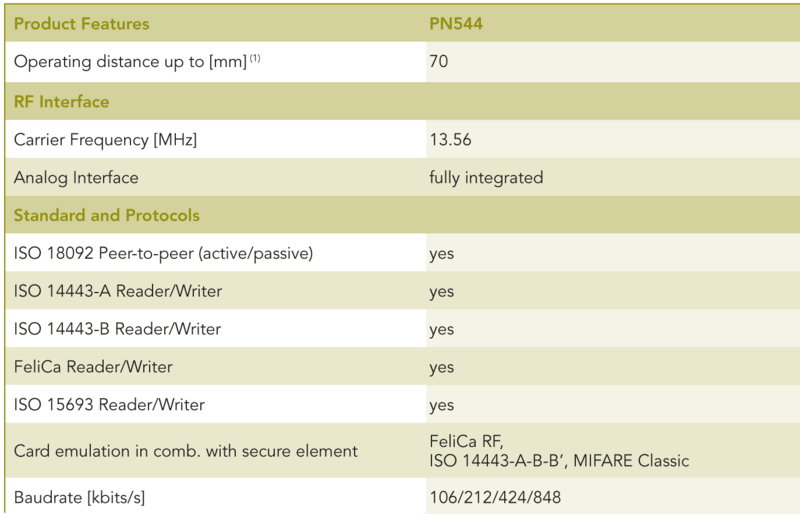 The Nexus S NFC controller is NXP’s latest, the PN544, which has hardware support for all three modes. At present, Android 2.3 only supports read mode, but support for all three are coming. Google has open sourced NXP’s controller software, and will slowly be updating the SDK with support for P2P mode and card emulation mode. At that point you can imagine applications like Bump leveraging NFC to transmit contact data between phones, using your smartphone as a mass-transit pass (buy your ticket on the phone, then use emulation mode to emulate the pass), or even a payment token. Google sent along a sample Google Places smart tag with the Nexus S. This is the kind of tag they’ve shipped out in business kits to a number of locations in their pilot city of Portland, Oregon to help launch Google hotpot. This specific tag is big and constructed out of vinyl, but that’s purely because it’s intended to be placed in a storefront window. Other smart tags can be much smaller, like a stickers. Playing around with the tag, I couldn’t find a stiff region or trademark inflexible portion like I’m used to seeing with RFID tags. Wave the phone over the sticker less than about five centimeters away, and it’ll read the tag. I tried through average thickness plate glass, and it worked fine. It’s insensitive to rotation, but works best when the phone is perpendicular and you couple those two loop antennas together - unsurprisingly. Reading the sample tag is nearly instant, and happens whenever the phone is on - a dialog pops up with info from the tag you’ve read. Inside tag reader is a long list of scanned tags. There’s a new settings option inside wireless & network settings for turning NFC on and off. Because NFC is always scanning in the background, it does use some current, but NXP’s documentation puts it at 50 microamps in power down mode with the RF detector active (ready to detect a tag), and 35 milliamps when briefly interacting with a tag. In practice, NFC shouldn’t adversely affect battery life. I haven’t had time yet, but will run our battery life tests with NFC turned on and off, but don’t expect a measurable difference. I’ve included a video of NFC reading the supplied tag in the Android 2.3 overview video on the following pages. "Nexus S... yes, yes.. good stuff. Whoah! Look at that myTouch!" Hmmm where'd the page load times for popular websites vs. other leading phones go? "the head phone jack on the bottom is beyond stupid. " Nope, not when the thing lacks an audio line out (which IS stupid). With the jack on the bottom, they can at least make a dock to drop the phone into in your car. That's a lot better than having to plug in a wire that's dangling across your dashboard, every time you want to listen to music. I'm a little confused by so many reviews being against the jack placement; usually giving the lame reason that it's not what everybody else does. You think Apple thinks that way? I look at my phone to select a track etc. and then i put it in my pocket upside down so the placement is perfect. Not that this is much of a serious matter. Lack of line-out is one of those things that would be hard to give up if I decided to move from iOS to another mobile OS. I use my iPhone for audio in the car at least twice daily and having line-out audio and charge capability through a single cable is simply awesome. My stock radio even allows adjusting the level of the aux-in (separate from the volume) so that it matches the volume of all the other sources. Those benchmarks you refer to are probably Quadrant and the reason why a Snapdragon device like the G2 performs better than the Galaxy S was because it had 2.2 while the Galaxy S had 2.1.